I am quite open about the fact that I have Obsessive Compulsive Disorder, or OCD. Talking about it comes easy to me. More difficult to handle are the reactions I get from others. “So are you like that nerd on The Big Bang Theory?” someone in a work meeting recently joked after I mentioned my OCD. That nerd is Sheldon Cooper, a character on the popular CBS sitcom whose habits include not wanting his roommates to sit in his spot on the couch and knocking three times. Sheldon is often what people think OCD looks like. I don’t watch the show, but I have yet to hear of an episode where it takes Sheldon more than an hour to leave the house because he needs to repeatedly check all the taps in his apartment to make sure there is not even the tiniest drip that could lead to a massive flood, destroying all his Nirvana memorabilia, killing his cat, and leaving him homeless. I doubt this would make for Emmy-winning television. The Big Bang Theory is certainly not the only show to play OCD for laughs. Glee, Friends, and Monk have also reduced it to a punchline. Movies from As Good as It Gets to The Aviator depict OCD as a quirk, eccentricity, or Type-A personality indicator. Marketing campaigns joke about Obsessive Christmas Disorder, online quizzes ask “How OCD are you?” and Khloe Kardashian calls OCD, which she doesn’t have, a “blessing” because it enables her to create perfectly symmetrical stacks of Oreos. Of those with clinical OCD, more than 90 percent have both obsessions and compulsions, but pop culture portrayals focus only on the latter. Portrayals are also often exaggerated, with OCD depicted as being performed in a specific way (often counting) or as a character’s defining personality trait. These negative portrayals not only diminish the severity of the problem, but also hurt those, like me, who don’t consider embarrassing blisters on their hands from repeated doorknob checking a blessing. Not all people with OCD are clean freaks, counters, or constant hand washers, but that is what pop culture has reduced us to. A few months ago, a friend visited my apartment and was disappointed it wasn’t cleaner. They assumed my OCD made me exactly like Friends’ Monica Geller. The apartment wasn’t clean, but my stove certainly was—I hadn’t used it in months because checking to make sure it was off became too exhausting and it was easier not to use it. Unlike me, Monica never survived on microwaveable Lean Cuisine entreés and Cheerios for several months to avoid the stove. It took until 2013 for me to see a portrayal of OCD I could finally relate to. 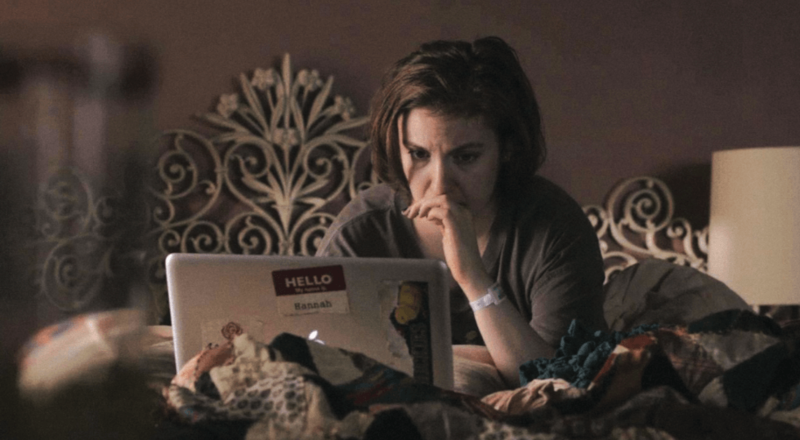 Many things about Lena Dunham’s HBO series Girls frustrated me, but the show’s depiction of OCD perfectly captured my crippling feeling of frustration, darkness, and isolation. Talking to her therapist, Dunham’s character described how her compulsions and rituals would keep her up until the wee hours, leaving her exhausted and zombie-like in the morning, when she would wake up and do it all again. When my OCD is at its worst I often put off going to bed, staying up until 2 or 3 a.m. to watch something I am not even all that interested in (Top Chef: Colorado, anyone?) just so I can avoid my pre-bedtime lock and window checking. In the morning, I stay in bed long after my alarm has gone off because the thought of getting up and doing my hours-long pre-leaving-the-house checking, followed hours later by my pre-leaving-the-office checking, has me feeling exhausted before I even have my feet in slippers. In between all my checking, I remain hopeful there will be more positive pop culture depictions of OCD and mental illness. John Green’s recent novel Turtles All the Way Down, which is an account of Green’s own struggles with OCD, gives me hope, as do the better and broader representations of mental health issues in characters like Gretchen Cutler in You’re the Worst and Ian Gallagher on Shameless.